Emile Taddeoli is born on the 8th of March 1879 in Geneva, his passion for engines and mechanics starts at a very young age. After some moderate success as a cyclist, motorcyclylist and car driver he becoms attracted by the third dimension. Having heard of Santos-Dumont and Blériot he also wants to become an aviator. Early 1909 he takes all his money and leaves for Mourmelon (F) to learn how to fly, later, he buys his own aircraft and despite his relatively low experience participates at several meetings in Portugal and Italy. Back in his home town, he starts flying around Switzerland in his newly aquired Dufaux biplan. During a meeting in Luzern in autumn 1910, Taddeoli will be lucky in his misfortune as he collides with a line of trees just before landing. He leaves the wreck of his airplane unhurt and declares stoically "should I break trees or roc, I will not shake !" 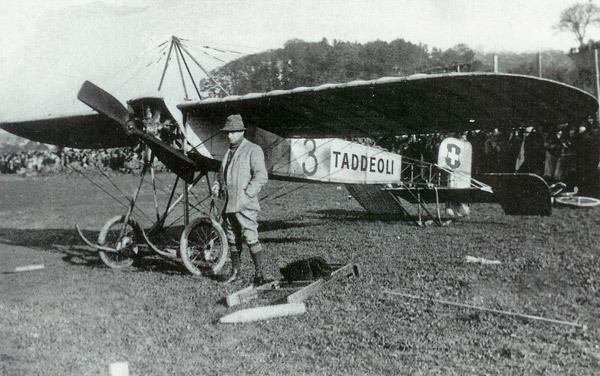 On the 10th of Octobre 1910 Emile Taddeoli obtains his swiss pilot licence number 2. At the Bern meeting, the swiss wings are counting their first victim : Hans Schmid kills himself in the crash of his Sommer aircraft. This tragic accident starts a crisis when the newspapers denounce what they call an unuseful aerial circus. One week later Taddeoli wins a generous prize after having reached an altitude of 350 meters, this prize and the returns of several demonstration flights allows him to buy, in April of the following year, a Morane-Borel. 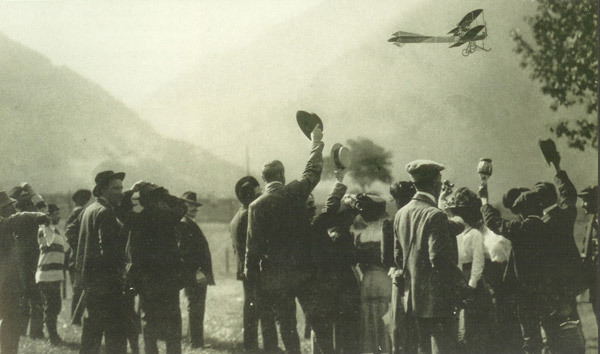 While taking off for the city to city flight Bern-Bienne in June 1913, he looses a wheel but the good fortune is again with him. Oscar Bider witnesses the mishap and takes off with the weel to catch up Taddeoli and inform him of the danger. Taddeoli understands and lands without problems in Bienne keeping the aircraft banked on the good side. During the following years, Taddeoli goes through all joy and sadness of an infatiguable show pilot. rewards, emergency landing, records and incidents succeed one another. His application to join the military aviation troops is rejected only because he is married. For a while he earns his living flying passengers, later he leaves Switzerland for Sesto Calende on the southern tip of lake Major where he is hired as test pilot for Savoia. This manufacturer of hydo-airplane is the leader in Europe and the production of the S-13 type is running at full speed. Documents shows that during his 5 years of activity, Taddeoli did proceed at the reception and flight test of more than 2700 aircraft. Early 1919 he is the first to cross the alps in hydro plane between Sesto Calende and San Remo. Six months later, in one hour 50 minutes and a passenger on board, he links lake Major with the Leman lake and overfly the Mont Blanc massif. The S-13 is very well known from him but will nevertheless become fatal to him, one year later. On the 24th of May 1920 at the Romanshorn meeting Taddeoli takes off for his last flight, his aircraft will desintegrate in flight killing him and his mecanic.